embracing sustainability... one step at a time: Recycling helper gadget #1 and a simple DIY pillow. Recycling helper gadget #1 and a simple DIY pillow. In one of our previous posts, I had promised an update on how we were using gadgets for our zero waste resolution. Today, I introduce you to one of the gadgets we use. 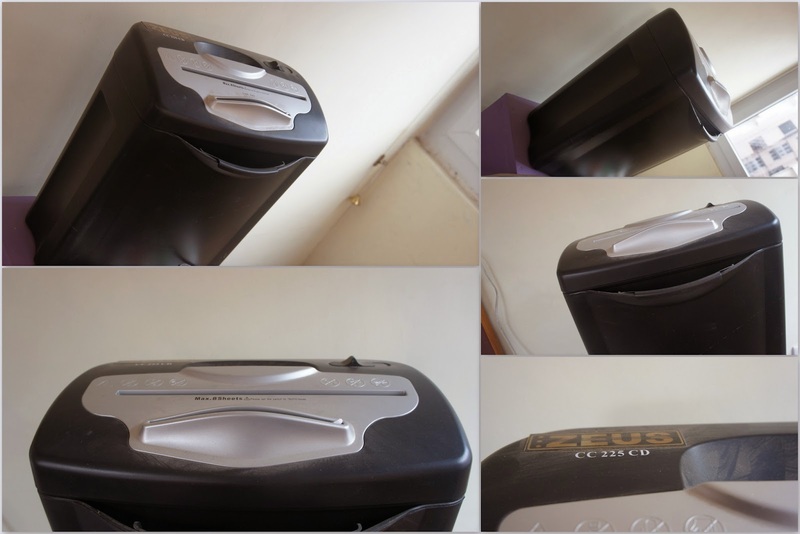 Mostly found in offices, sometimes at home, it is our PAPER SHREDDER! Yes. Our pictures are slowly getting better. Say Hello! I have always been a sucker for gadgets. Before we got married, my focus was more on "personal" gadgets - the Creative Zen media player(by far the best gadget I've owned), Ipods, little hexbugs... But ever since I've taken setting up and maintaining the house, my new love is all about the big, bad boys - home appliances, quirky tools, cleaning robots, the works! 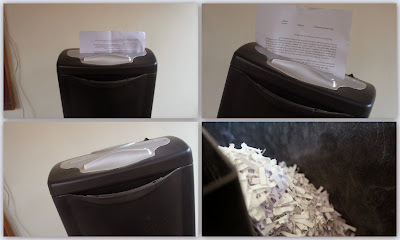 I always wanted a paper shredder, as I was a little uncomfortable with all our bank statements, etc. going to the paper recycler. And we certainly didn't want it to go to the landfill. Even though we switched to email statements/ bills, we do get some letters/promotions, company profiles etc. in our letter box. Also, the shiny/ glossy brochures that are sneakily inserted into our newspapers cannot really be recycled like paper. So these are candidates for our shredder. This guy is a fairly basic shredder, capable of shredding 8 sheets of paper at a time. It can also shred credit cards and CD's. We're still wondering what to do with the remnants of credit cards and CD's though. Any ideas? 2. Pour the shredded paper along with some water in a blender, and a little bit of fevicol. 3. We then took a basic sieve that we had and filtered some part of this gooey mix through it. Let it dry for a day or so, and voila! We had paper. Although it is a lot of fun , it is not something we can sustain. Does the picture speak to you? So, a little back story. New house and all, we thought we'd furnish it a little. As usual, the first thing we decided to add were some cushions to our newly polished cane sofa set (we got this as a wedding gift from our friends who were looking for ways to get rid of it. And it worked perfectly for us!). We were not too keen to buy pillows, because once they flatten out, we really didn't know the best way to recycle them. We were looking at alternatives, and that's when eureka moment happened. So, we bought two pillow covers from our online store, www.shopo.in (which sells only Made in India products, and got recently taken over by www.snapdeal.com :( ) and stuffed them with paper shreds! The paper shreds provide fluffiness. and once they flatten out, we stuff them with more! And the paper gets eaten. So, as long as we have paper to shred, we have a fluffy pillow. It is simple, and the pillow does beautify the sofas a little bit. And of course, there is some more waste being productively re-used, We are happy.